Product designed to clean the engine from carbon. Fast-acting product designed to clean stuck piston rings of gasoline and diesel engines from carbon. 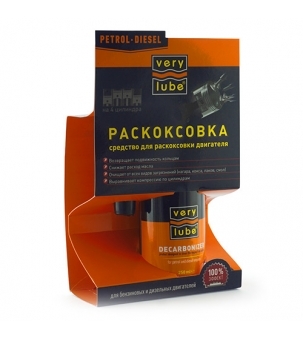 Application is recommended after engine overheating, by increased oil consumption and smoking. Introduce approximately 60 ml of product (1/4 of the bottle) into each cylinder through the plug hole. 1 bottle (250 ml) is enough to decarbonize 4 cylinders. Screw the plugs back. Wait for 60 minutes. Unscrew the plugs. Cover the plugholes with absorbing fabric to avoid dirt flying out and getting onto the paint. Rotate the engine with the starter for several seconds. Start the engine and run it at variable RPM for up to 15 minutes. During this time, the residues of the softened carbon will be removed through the exhaust system. Avoid getting the substance onto the paint.